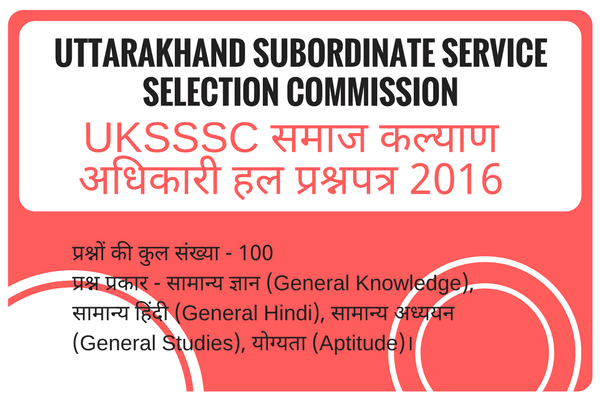 UKSSSC समाज कल्याण अधिकारी (Social welfare officer) हल (Solved) प्रश्नपत्र 2016, UKSSSC (UTTARAKHAND SUBORDINATE SERVICE SELECTION COMMISSION) Samaj Kalyan Adhikari Previous Year Question Paper with Answer key. प्रश्नपत्र विषय – सामान्य ज्ञान (General Knowledge), सामान्य हिंदी (General Hindi), सामान्य अध्ययन (General Studies), योग्यता (Aptitude). प्रश्नों की संख्या – 100 . Please post shayak librarian paper also.